All illustrations and text	©Dan Welchman Productions (our publisher). Not to be used or copied without written permission from the publisher. Buy a MouseTrial license key for unlimited play! All of the games in each MouseTrial module will give you some "free goes" so that you can try them out. But if you've run out of free goes then why not purchase a MouseTrial license key? For just $29 you can get a master license key which will give you unlimited	access to all of the exercises in all of the modules (including modules we add in the future!). Alternatively you can pick and choose individual license keys that give you access to one specific	module for $10 each. These prices are in US dollars but you can also pay in other currencies (to see the cost in another currency, try	one of the free online currency converters - xe.com is a good example). It only takes a few minutes to purchase keys from our	online store at Kagi and you can use them straight away. MouseTrial's DOMESTIC licence keys last forever! (it's a one-off purchase, not a subscription service) and you	can pay by PayPal, Visa, MasterCard,	Amex or many other options. For schools and professionals a CLASSROOM master key is available which allows you to use MouseTrial on up to	20 different computers at the same time (the ordinary DOMESTIC keys should only be used on one computer at a time). The CLASSROOM licence operates on a yearly subscription basis and costs just $39 per annum. To buy a license key, go to our secure online shop at Kagi. You can do	this by either clicking on (left) or	clicking on the icon at the the top	right of the page. The first page you'll see will be a list of all the modules available. Select the	products you want to buy and then press "Continue" at the bottom of the page. At the top of the next page you'll see a summary of the items you've selected	(you can go back if any of this is wrong). Below that there are boxes where you	select your preferred method of payment and the currency you'd like to pay in. Finally, there are some boxes for you to enter your address. When you've finished, press "Checkout" at the bottom of the page. The final page is headed by a list of the items you're ordering, including any	sales tax (or V.A.T) due where you live. Below that you will find boxes for you to	type in your name, email address, and credit card details. When you have typed in	all the necessary data just press "Purchase" and the process is complete. Shortly after completing your purchase an e-mail will arrive looking	something like this. note that MOUSEmy1stlicensekey is just a dummy license key for example	purposes, it won't actually work if you type it in. 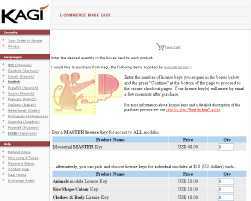 KAGI is a leading internet store. We use KAGI for all sales of software license keys and disks	because they are international, competent,	fast	and above all extremely secure. KAGI's customer support pages	provide extensive further reading about	how they work including security mechanisms and refund procedures. It only takes a minute or two to buy a license. You don't have to "register" and you won't be	asked for any irrelevant details. MouseTrial license keys will arrive by email a few moments after you make your purchase. Buying from the MouseTrial shop is very safe. KAGI handle the secure transactions using VeriSign	Digital ID technology. 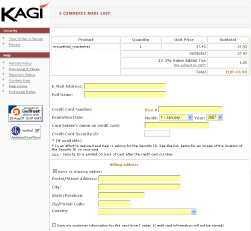 You can read more about KAGI's security measures and policies on their	excellent FAQ pages. Your email address and all other personal data will be treated in the strictest confidence. We take a very strong stance against spam (indiscriminate unsolicited bulk e-mail) and will never	divulge your details to third parties other than KAGI. You will not receive any promotional	emails from us.